Three-hundred and sixty degrees of snow dusted hills surround Klamath Falls. The city (it is a city) is clustered around a friendly historic downtown and the long stretch of Sixth Avenue, which reaches out from the center to the edges of town. Arriving bleary eyed from the airport (they have two flights in and out each day from Portland and San Francisco), I hopped into my pop can sized rental car and followed directions to the city center. 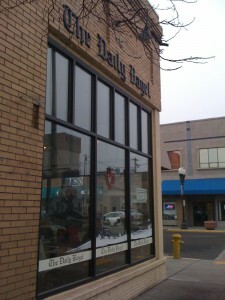 After cruising up and down the main drags, I settled in at The Daily Bagel to kick start my day. In addition to the attractive typeface heralding their name, the Daily Bagel boasts a delightful selection of artisan bagels and some sweeter treats. It was a raisin bagel instead of blueberry bagel. While I am not generally allergic to blueberries, it is entirely possible that I am allergic to them when they occur in artisan bagels. The Daily Bagels were not as artisan as the other artisan bagels I have consumed. For some reason, commercial, pre-packaged bagels do not provoke an allergic reaction. So, it is entirely possible that The Daily Bagel provides less of an artisan experience than I give them credit for. My overall sense of well-being was particularly high since I had just discovered that spending two days in Klamath Falls was not going to be so bad after all. Therefore, I didn’t have any stress induced histo-immune reaction to the artisan bagel. Regardless, it is great to start the morning, and a trip, by taking in some majestic scenery and languidly consuming a quality bagel, especially one that does not cause a full body rash, before jumping into a day of meetings in K Falls. Highly recommended. Newport: Birthplace of Rogue Ales. Scotties Drive-In: it’s like being 17 again!